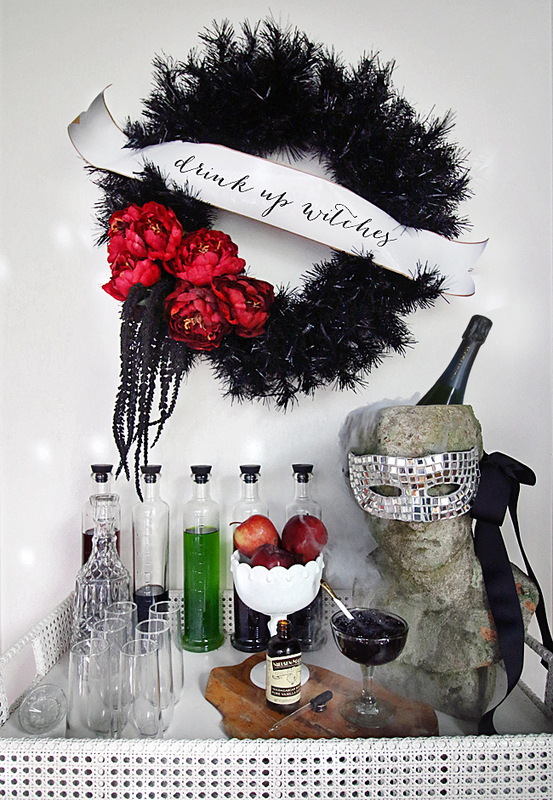 Yesterday, I was talking about incorporating everyday items into your Halloween decor & today I wanted to share how I did just that. 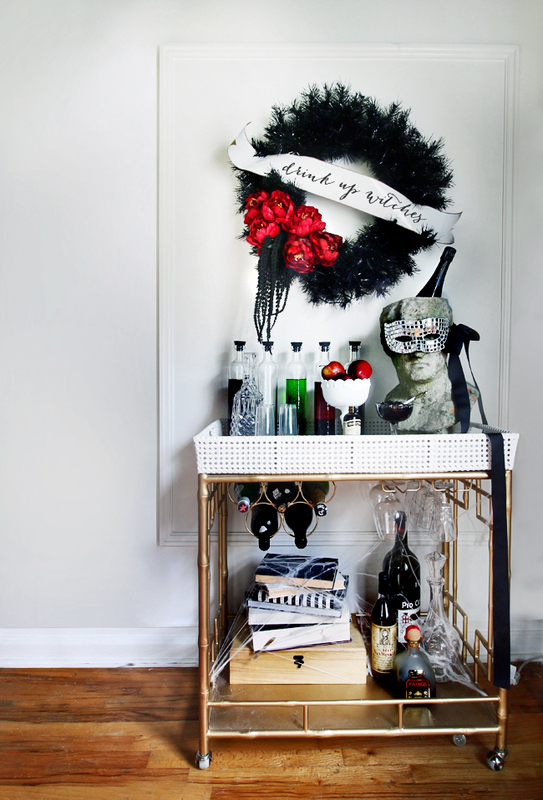 The only Halloween purchases made for this Boo-zey Bar Cart were a bag of Spider Webs & a disco ball mask, but lets be honest… that was coming home with me regardless of the holiday season! This entire vignette began with the idea to use my concrete bust as a Champagne bucket rather than his normal job of being a planter. Instantly spooky right?! I pulled him in from our patio (cleaned him off a bit) and transformed him into the star of the bar. 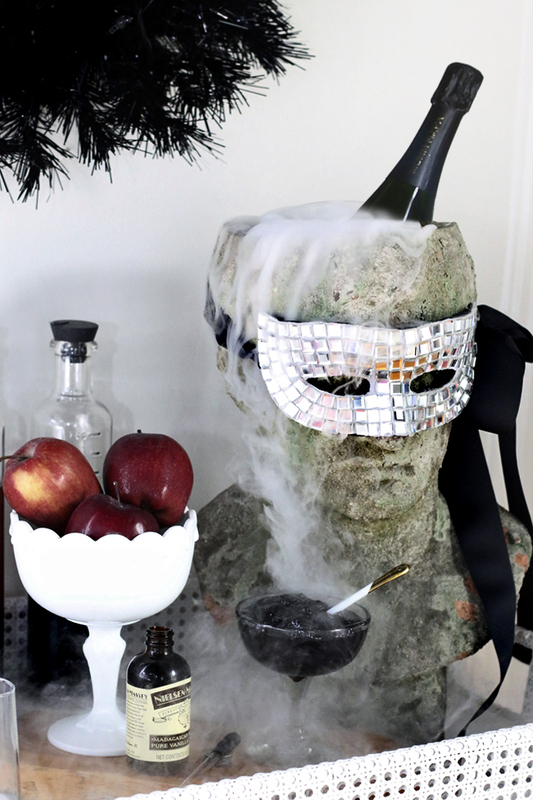 I utilized an old plastic container as the liner to hold the champagne bottle as well as the dry ice which amped up the spook factor even more. 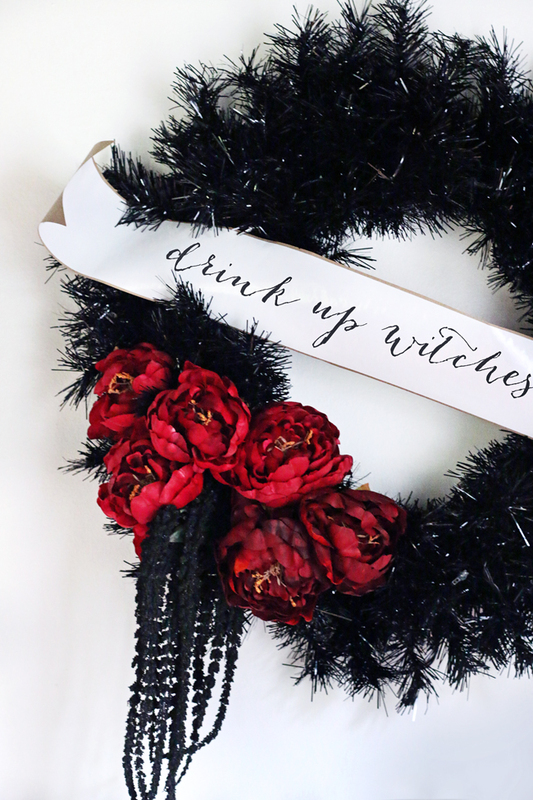 Wanting to encourage my guests to feel welcome to pick their poison, I added a black funeral inspired wreath with a sweet reminder to “Drink Up Witches”, as it felt apropos for the occasion. My blood red faux peonies & black florals added a dark & chic vibe I think even Morticia Addams would approve of. Setting the rest of the scene came from filling old Hangar 1 Vodka Bottles with water & food coloring, or they could easily be various cocktail mixers as well. A few glasses, the ingredients for my Dragons Breath Cocktail & a few poison apples for good measure. 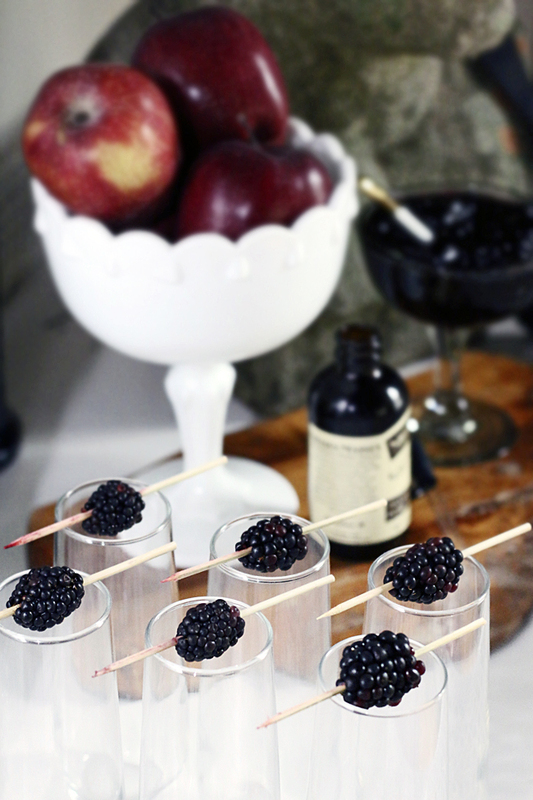 The cocktail is a Champagne & blackberry concoction, which led to the garnish of blackberries on mini skewers. Normally I would have an issue with the blackberry juice on the bamboo, but it works perfectly for this application as it takes on a bloody, I have just been impaled sort of vibe. 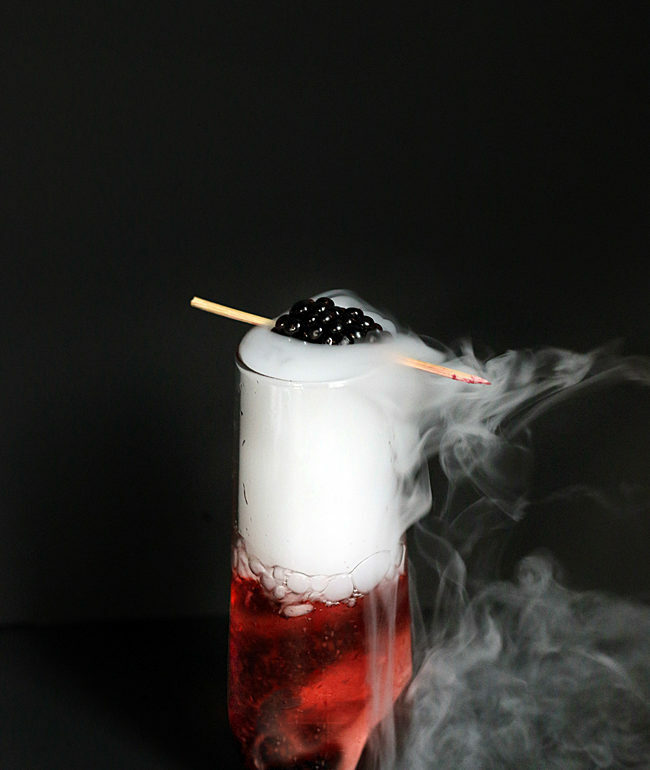 Made with a scoop of Blackberry Jam, a touch of pure vanilla extract & your favorite champagne, this fruity cocktail looks far more menacing than it actually tastes. 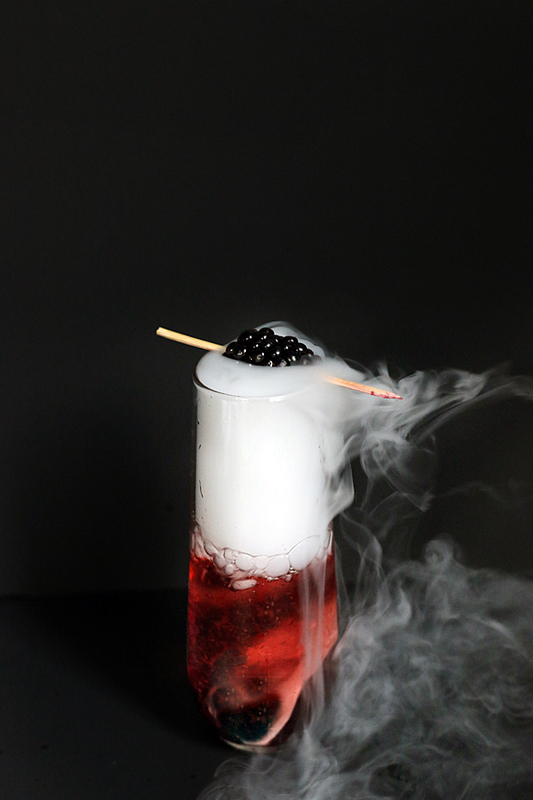 Once the ingredients are added in the glass, stir together to create a gorgeous red hue. Serving tip: Using a medicine dropper for the vanilla extract really makes you feel you are creating the perfect potion!